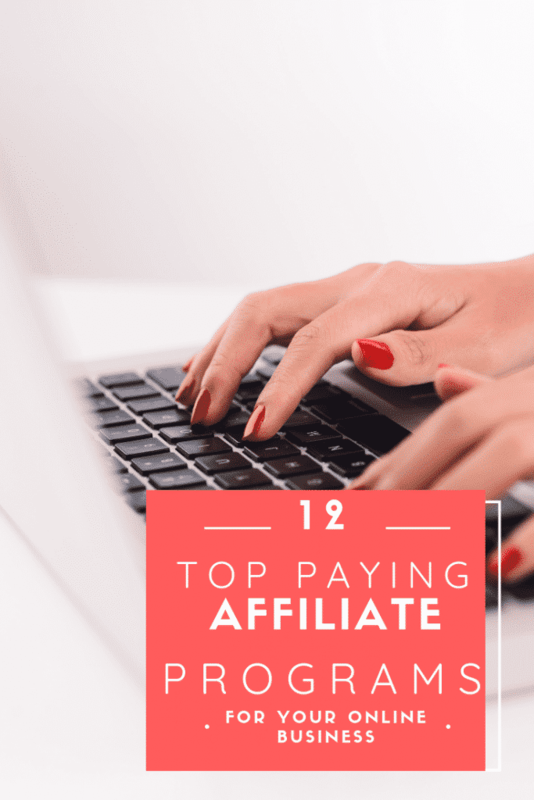 Bloggers and those running an online business have many different options for earning money online and one of those is top paying affiliate programs. Running an online business is great. Not only does it give you the flexibility to work from varying locations, it also gives you the option to have a more flexible work schedule overall. You can monitor and manage your online business from any location, at any time, from anywhere in the world. Pretty powerful, right? Plus, there are a TON of different ways that you can earn revenue with your online business. For more options for earning money online with your website visit the Blogging for Money page. One avenue of revenue that many businesses overlook is potential affiliate programs. Affiliate programs are not only simple to be a part of, they are passive income that earns you money potentially 24/7, even when you’re sleeping. Who would say no to making a few bucks while they’re catching some zzz’s? Basically the idea behind an affiliate program is that by helping sell someone else’s product you get a percentage of the sale. An example of this would be if I have a certain accounting program that I use to keep track of my online business and I recommend it to others by writing a blog post about it, displaying an ad for it on my site, or by simply suggesting it when someone asks about which program I recommend. I would use a unique link provided by the company so that the company knows who referred them. If the customer decides to buy then I would receive a percentage of the sale as agreed upon through the affiliate program. Top paying affiliate programs can be a great way to earn money but it needs to be done right. First of all publishers need to make sure they are following the rules of disclosing to their readers or customers when they are using affiliate links. Be sure you are familiar with the FTC rules regarding this. These rules were put in place to protect consumers so that they know if you are benefiting from recommending a product or service. If done right, any recommendations you make should be authentic and not sound like a sales pitch. If you make a habit of recommending products pr services you really do use and love then your readers generally don’t care if you will make a small percentage off of their purchase. You also want to make sure that the products or services you recommend are a good match for your readers. For instance, if I promoted a course on how to start a freelance writing business from home that would be a good fit for my specific readers who are generally looking for work from home opportunities. If I instead recommended to my readers my favorite curling iron that I use that would be a bad idea because even though it is a product I use and love, my readers don’t come to me for beauty advice and I could potentially lose readers by doing something like this. Once you find a product that you want to recommend and is a great fit for your readers then you can sign up to be an affiliate for them and make sure you are aware of the rules of each different affiliate program. Some programs only allow you to promote through specific channels. Commission Junction– If you are looking for an affiliate network that has a wide variety of programs to work with in many different niches then CJ is a great place to start. Ebates- Looking for great savings to pass on to your readers, customers, and clients, while also being able to earn affiliate revenue from their great platform as well? Ebates is an excellent way to be able to earn substantial affiliate revenue by referring others to use Ebates. Plus, those who sign up get a bonus, too! Because Ebates is a program that saves other people money and you are not actually trying to sell them anything it is usually an easy one to promote. Amazon Associates- If you’re debating on whether to become an affiliate with Amazon or not, what are you waiting for? Not only are they the largest online retailer, but they also offer up 10% commission on purchases through your promoted Amazon products. Plus, they literally have almost ANY item that you could think of to promote on your online site. Talk about a potential endless opportunity to earn some great affiliate revenue! ShareASale- ShareASale partners with some great companies that offer the guidance that you need to advertise directly on your site. The commission structures vary depending on the company and the item but they are a good company to work with that are used by many. Etsy- If your online business caters to creativity, arts, and crafts, then becoming an Etsy affiliate may be perfect. Once approved, you can promote your favorite Etsy products directly to your site. Airbnb- Looking to provide travel and lodging options for your online customer base? By becoming an Airbnb affiliate, you can do that. When approved, you can then link up your favorite Airbnb listings to showcase them directly for all to see. Every time it gets booked, you earn a commission! eBay- Yes, you can even be an affiliate with eBay if you want! Partnering with eBay is another great way to have access to an extremely online large business and promote products directly on your site. Tailwind- Do you create graphics or products and then promote them on Pinterest? The Tailwind affiliate program may be perfect for you! For every referer who signs up through your affiliate link, you earn a 15% commission on each and every sale. Udemy- Is your online business centered around learning or providing content for others to grow their knowledge? Udemy may be a great platform for you to promote. They offer courses that you can promote and earn commission off each sign-up. Plus, they give extra discounts to their affiliate partners as well! Microsoft- What a great affiliate program to join especially if you are using some of their products as well. Once approved, you can promote apps, games, and software products and earn up to a 10% commission on every sale. Clickbank– If you want to sell digital products to your customers Clickbank has a wide selection across many different topics to choose from. Ejunkie– This is another great place to find digital products and downloads you want to promote. There are even more top paying affiliate programs out there online, you just have to search for them. Many companies offer an affiliate program, so if you have a company or a product that you love, reach out to them and ask if they have an affiliate program that you can join or try searching that product name plus the term “affiliate” and you may be able to find what affiliate program they use or where to sign up. While it may take a while to start earning significant revenue from your affiliate partners, it is possible to do so. Choose a few to start and give them time and attention to reach their potential. Once you get the idea of how affiliate marketing works, you can then start implementing more should you choose to. Have fun with the idea of being able to earn money 24/7!! PreviousAmazon Warehouse Jobs: Is Amazon Camperforce Right for You?